A field full of dead grass is being turned into a forest by children at Du Noon’s Sophakama Primary school.On Friday last week the school children, assisted by their teachers, planted 89 trees in the school’s backyard, 29 of which were fruit trees which are hoped to contribute to the children’s diet in the future. The trees were provided by Greenpop, a tree planting organization, who bought them with R30 000 provided by Eurolux, the manufacturers of energy saving light bulbs. Greenpop are also to take care of the trees to ensure they grow to maturity, said Eurolux Brand Manager Andrew Wex. Greenpop director Misha Teasdale said they approached Sophakama with the idea of planting trees on the school’s property because there was a lack of plants and trees growing in the area. On Friday over 40 schoolchildren who took part in planting the trees, were joined by parents and grandparents. All the trees, excepting for the fruit trees such as peach and naartjie trees, were indigenous, said Teasdale. He said it was hoped the trees would create a sense of pride at the school and amongst the students and would “stimulate a relationship between the students and the environment”. Once the fruit trees started producing fruit, it was hoped they would provide a long term social and economic benefit. Wex said the company funded the initiative in the hope of creating an environment that was nurturing and conducive to learning. “We want to make a place where kids can wake up in the morning and have the urge to go to school,” said Wex. He said it was hoped the initiative would inspire other residents to notice the benefits of a green environment and that if people could care for the trees, they would care for each other. This was particularly relevant to Du Noon township “because of the racial divides that led to 2008 xenophobic attacks which started in Du Noon in the Western Cape”. Apart from providing funding the trees and their maintenance, Eurolux was also refurbishing damaged paving and prefab classrooms, bringing their total contribution to the school to almost R200 000. He said private companies needed to get involved in projects “like this” because government funding was “so thinly spread across all these schools”. School principal Sabelo Makhubalo said the trees would change the image of his school and the children’s attitudes towards plants and the environment. 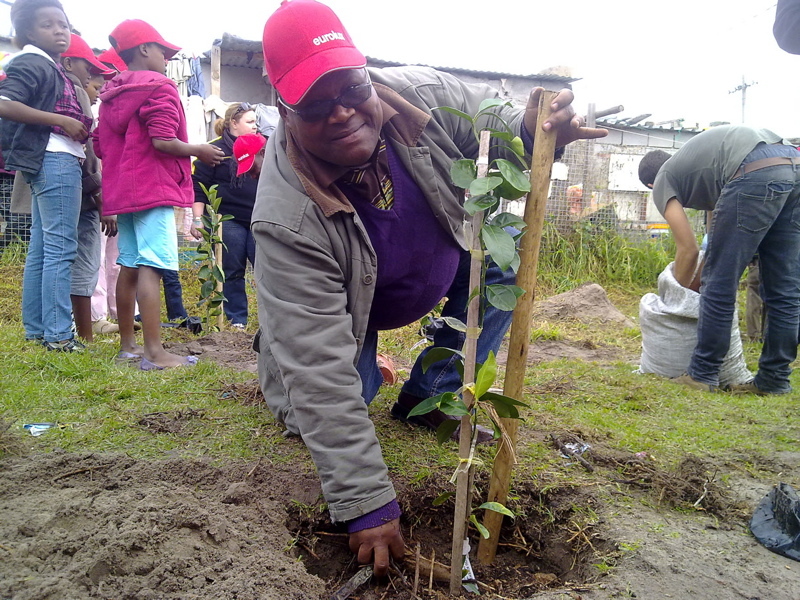 “Our children do not have trees at their homes but now that they have trees at school they will learn to love nature and respect it,” said Makhubalo. School Governing Body chair Rev. Simphiwe Songwiqi said: “When you see a tree there is hope.” — Peter Luhanga, West Cape News.